My birthday is apparently not over. I just had birthday ramen with Angie and Matt when I returned from San Francisco. 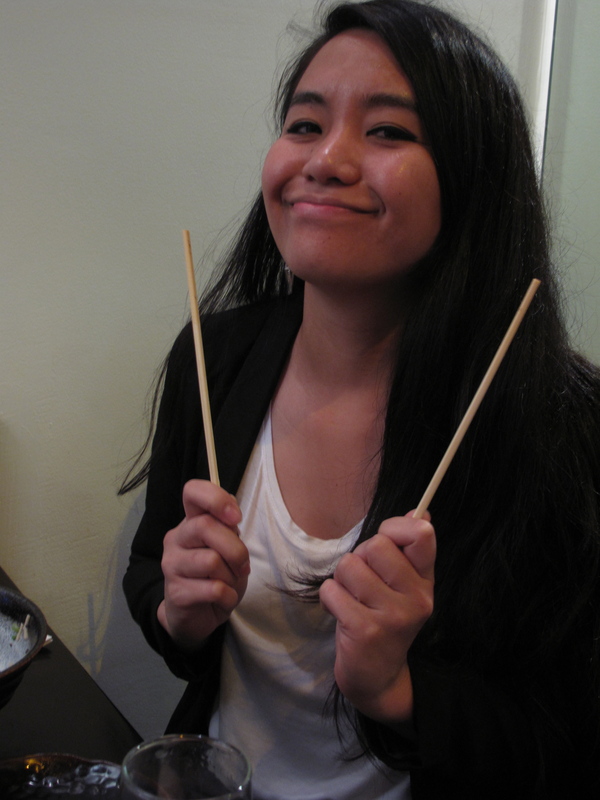 Then Sean decided to take me out for birthday ramen again on Tuesday! 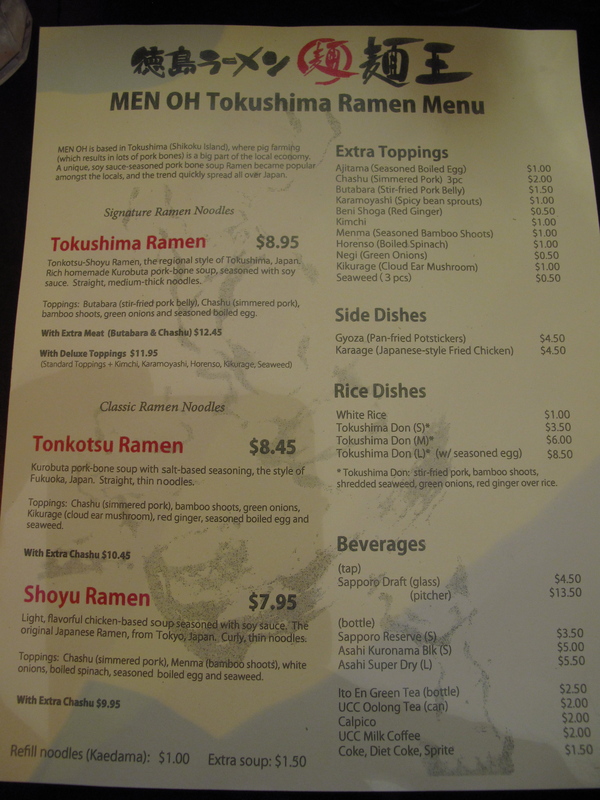 I chose Men Oh Tokushima Ramen in Little Tokyo, since Sean has not been and I wanted to try their classic tonkotsu broth. kitchen isn’t behind the bar! 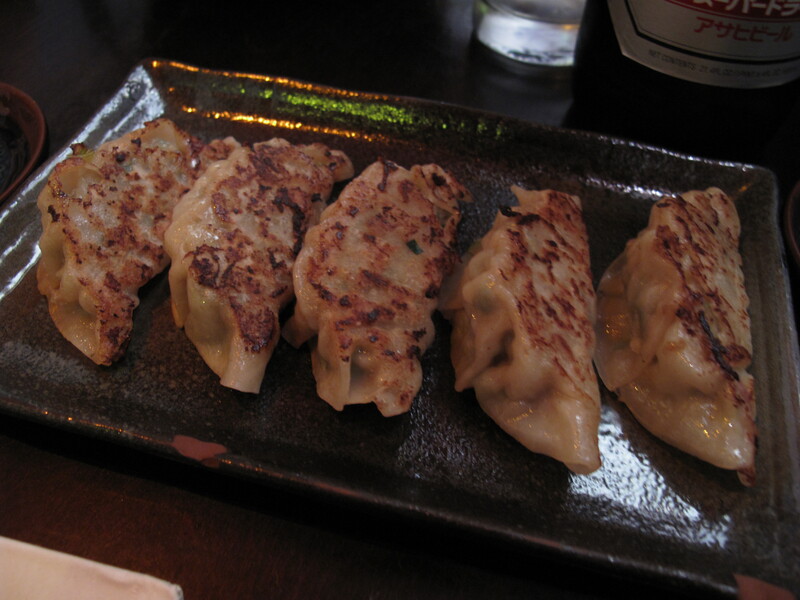 We started off with gyozas and shared a large Asahi. 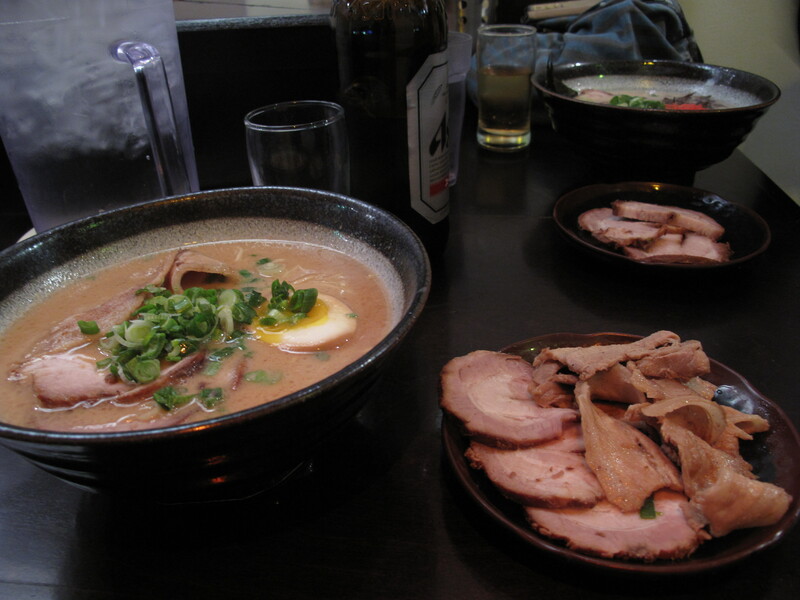 I ordered the Tonkotsu Ramen with extra chashu and Sean ordered the Tokushima Ramen with extra meat. They serve the extra meat separately, just like how they do at the Shin Sen Gumi around the corner. Their classic tonkotsu broth was amazing. 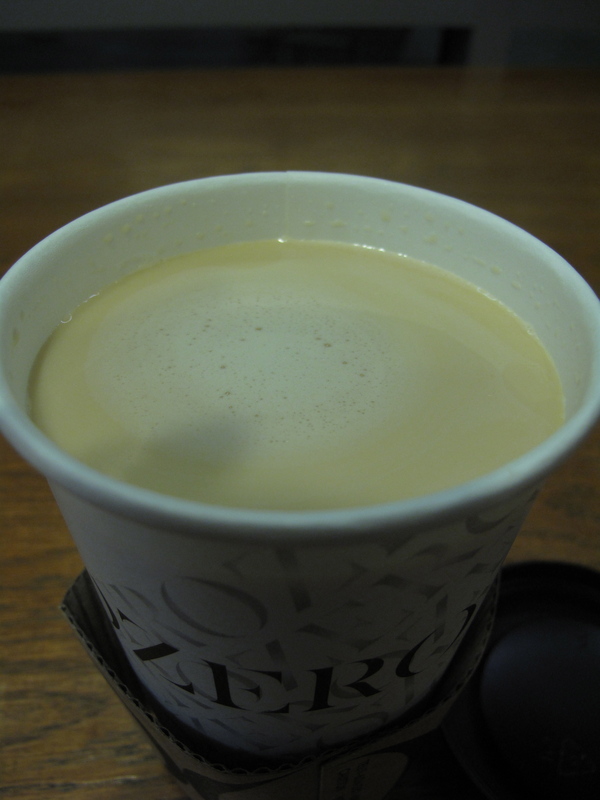 The pork flavor was very rich but the broth consistency was not too heavy. The chashu was tender but I noticed it seemed more fatty and thicker than I remember from the last time I was there. I wish they would just put the extra meat in the bowl so it would already be warm. I loved the straight noodles, I practically devoured those right away and the green onions, ginger, seaweed ,and kikurage (earwood mushrooms) complimented the ramen as a whole. I used to dislike ginger, but I’ve grown to appreciate it! The ginger and mushrooms gave the ramen a nice little crunch as I ate them with the noodles. Yum. The gyozas were pretty good. Sean thought the ramen was excellent although he still prefers Shin Sen Gumi. He thought the chashu was too thick and fatty, there was no ginger, and that the broth was too rich. He also felt that the ambience was lacking. The service was descent. We had a timid Japanese lady who seemed like she was very sleepy. It seemed that a different server would check up on us more often than she did. I thought the ambience was not bad, I actually like it sometimes when its quiet in a restaurant, as opposed to some ramen houses where everyone yells when you walk in and out or order something. That night I preferred it quiet. This is my “belly full” face. I highly recommend Men Oh. It just seems like not enough people know about it! The restaurant isn’t exactly in an obvious location. Daikokuya, Shin Sen Gumi, and Kouraku’s (yuck) front entrance faces out onto the street, but Men Oh’s front faces a parking lot that you first have to get into, before you realize that it’s even there. Still, I would rather go to Men Oh over Daikokuya…. 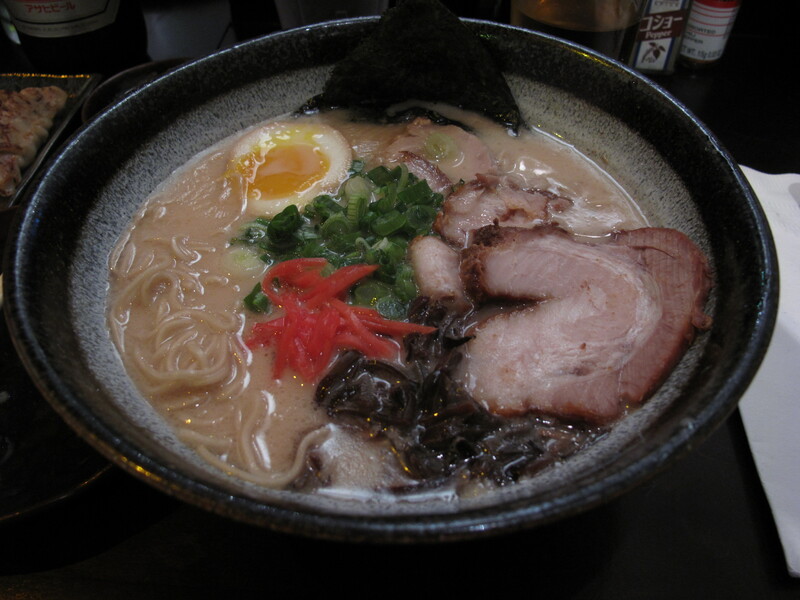 and possibly Shin Sen Gumi, if I’m not in the mood to be picky with my ramen order. FYI: There is a Men Oh restaurant in San Francisco, where I believe it first opened before they opened one here in LA. But I totally forgot about that! Ugh. 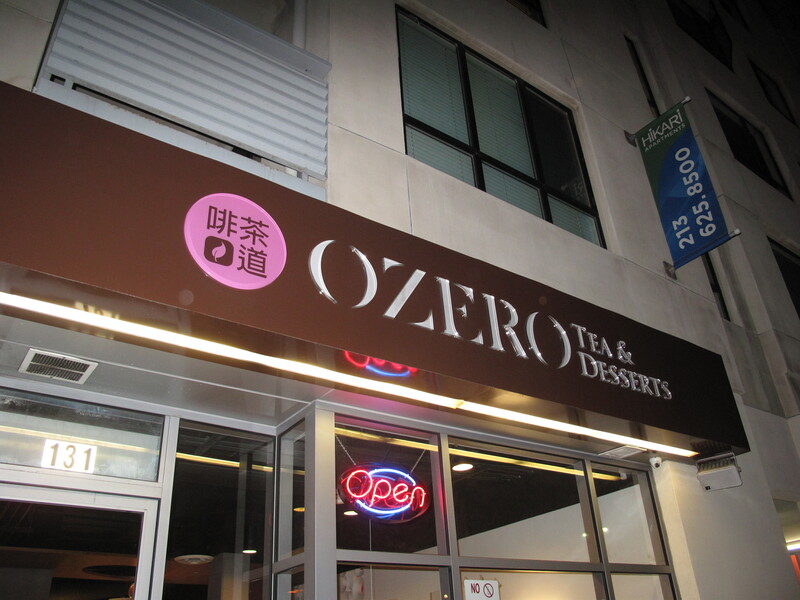 After stuffing our faces with great ramen, we stopped by Ozero, just down the street from Men Oh, for some hot green milk tea. I don’t think I can eat ramen again for at least a week or so…. Located in the Honda Plaza, across from the popular Sushi Gen. Parking is only $3 if you get your ticket validated. 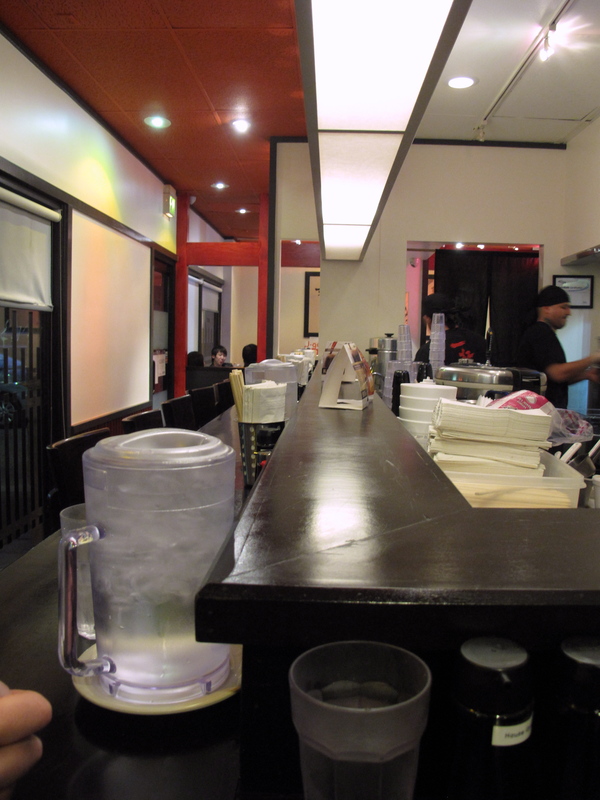 This entry was posted in California, Downtown Los Angeles, Food, Japanese, Little Tokyo, Men Oh Tokushima Ramen, Ramen, Ramen Run, Restaurant Review, Tonkotsu and tagged Little Tokyo Los Angeles, Los Angeles, Ramen. Bookmark the permalink.